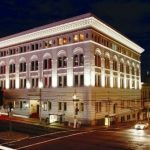 Music City Hotel is located in the vibrant Polk Gulch/Lower Nob Hill neighborhood. Immediately to the left when exiting the Hotel is Polk Street, filled with a wide array of incredible food options, shops, as well as unique bars and nightlife. 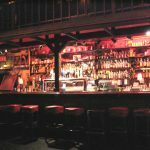 The neighborhood has historical significance as the original center for San Francisco’s LGBT community, and more recently has harbored members of the arts community and important music venues such as Kimo’s, Great American Music Hall, The Regency Ballroom, Hemlock Tavern, The Masonic Theater, and more. 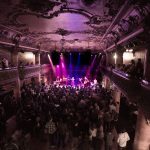 In the 1960s at the height of the counterculture movement, a music venue in the neighborhood called The Avalon Ballroom played a vital role in hosting influential acts such as Moby Grape, Quicksilver Messenger Service, and the Grateful Dead. Music City Hotel is very centrally located, and it is possible to reach many nearby attractions on foot, or by a combination of walking and local MUNI bus ($2.50 for 90 minutes of travel, exact change only). These destinations are all located within a 15-20 minute walk from the hotel: Union Square, Chinatown, Nob Hill, Civic Center, Japantown, Little Saigon. These famous neighborhoods are located slightly further, or reachable easily by bus: North Beach, Fisherman’s Wharf, Russian Hill, SOMA, Financial District. Several cable car lines are located nearby such as the California line just two blocks north of the Hotel. Here are some must see areas located within 30-45 minutes by bus: The Golden Gate Bridge, Haight Ashbury, Golden Gate Park, Mission District, The Castro. Both a Whole Foods and a Trader Joe’s grocery store are located within a five minute walk from the hotel. There is a Walgreens pharmacy and convenience store located across the street from the hotel that is open until 10pm. 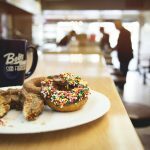 Beloved donut shop open 24 hours a day and serving quality donuts and pastries since 1960. Try their 3 minute donut challenge if you dare. Coffee shop and Internet cafe nearby the Hotel. Serves beer, wine, pastries and other food items. Large space with WiFi access and computers available to rent. 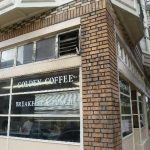 Relaxed and quiet spot for quality sandwiches, coffee, breakfast burritos and more. Friendly staff. 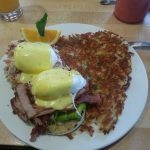 Quality cafe for breakfast and brunch specializing in eggs benedict varieties and corned beef hash and other unique twists on standard breakfast fare. 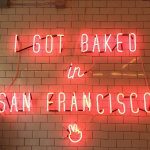 Trendy and popular bakery for rich and unique sweets, including the famous cruffin! Iconic neon pink sign is perfect for photo ops. Get there early if you crave the cruffins – there’s often a line and they sell out by 9am. Landmark seafood counter, known as an institution for quality and fresh seafood for over 100 years. 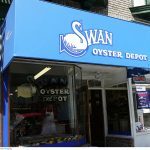 Beloved by both locals and tourists, be prepared for a slight wait due to the popularity and small size. 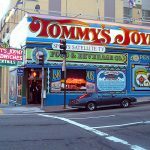 A San Francisco institution around since 1947, Tommy’s Joynt features incredible barbeque meat, sandwiches and American comfort food. Vibrant communal dining hall seating including booths, along with a huge international beer selection. Metallica’s favorite place to eat when they played the city’s rock clubs in their early days. 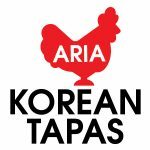 Casual, friendly establishment serving quick and tasty homestyle Korean American food, including variety lunch boxes, ramen, sushi, and bibimbap. The korean fried chicken lunchbox is highly recommended. 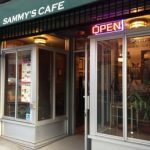 Great cozy and local feeling spot for an inexpensive and quality diner breakfast. 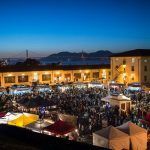 Lively and bustling event held in scenic location with views of the Golden Gate Bridge and the San Francisco bay. Dozens of food trucks form a caravan circle and offer up delicious and unique street food variations from all over the world. Beer, wine, and cocktails are served also, alongside live local music and DJ’s. Consistently one of the favorite events of our guests. Polk Street is one of the major areas in the city that people from all over flock to for bars, nightlife and entertainment. 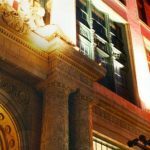 On Friday and Saturday nights the street is bustling with activity, giving off a fun and festive vibe. Here are a few of our recommendations for bars, entertainment and nightlife near the hotel. The Hemlock Tavern (great for local live music! ), McTeague’s Tavern, Mayes Oyster House, The Kozy Kar, Soda Popinski’s, The Pour House, Upcider, The Regency Ballroom, The Great American Music Hall. 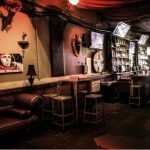 Spacious and casual dive bar featuring a back room with live music most nights of the week. Great place to meet people and rock out to some local music, also boasts a smoking patio. Check their event calendar. 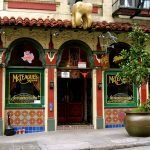 Taking it’s name from an 1899 novel about a San Francisco dentist who lived just above, McTeague’s is your Polk St. bar destination for watching sports of all kinds. Spacious with plenty of seating, and screens displaying everything from U.S. college sports to the English Premier League. On Friday and Saturday nights the atmosphere becomes more lively and party-like. 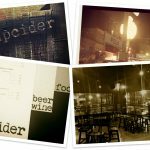 Relaxed and cozy spot specializing in hard ciders from around the world and late night bar snacks. 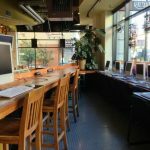 Location is upstairs and is on one the busiest corners in the neighborhood, making Upcider an excellent place to watch the hustle and bustle of the neighborhood go by through its large windows. 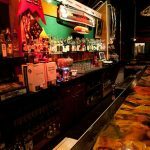 Fun and wacky themed bar with decorations honoring the 70s and 80s including shag carpets, a van with a water bed, old car seats, mirrored ceilings and more. A unique experience. Playful bar with russian themed cocktails, roulette wheel with drink prizes, and playable vintage video game consoles hooked up to a flat screen TV to battle your friends. 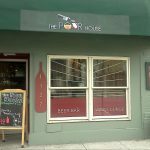 Wine bar with extensive international and local selections, tasting specials, and a cozy neighborhood feeling. This Scottish bar has a wide variety of whiskey selections, spacious and welcoming atmosphere and inexpensive drinks and specials. Known for their excellent trivia night which occurs every Tuesday night at 8:30pm. Large concert hall and entertainment venue featuring a variety of nationally touring performers and acts. Look up their concert calendar. Classic concert venue with beautiful ornate interior, excellent sound and service. Intimate feeling and setting despite playing host to well-known and nationally touring acts. Once hosted bands such as The Grateful Dead and Journey in their heydays. Large movie theater located nearby the hotel. 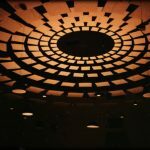 Audium is ’the only theater of its kind in the world, pioneering the exploration of space in music’, providing an auditory sensory experience where the listener is bathed in sound moving across 176 speakers. To reach the Hotel from SFO airport you will need to use the BART train from the station at the airport. You will take the BART train to either Civic Center or Powell Station (cost of $8.25 per person). From either of these stations it is about a 20 minute walk to the Hotel or roughly a ten minute bus ride. It is slightly faster to go through Civic Center station, however it is slightly more pleasant of a transit when coming from Powell Station due to not needing to go through the Tenderloin or Central Market neighborhoods. It is preferred to travel through the Powell station at night. From Civic Center you will need to walk north from the station past the civic center plaza and city hall to reach Polk Street. It is a straight shot to walk up Polk Street until you reach Bush St. and then take a right and we are halfway along the block towards Larkin st. To reach the Hotel by bus from Civic Center, find the bus stop for the #19 bus in front of the Asian Art Museum, along civic center plaza. Bus #19 turns onto Polk Street after a few blocks, get off the bus at Polk St and Sutter St. and walk one block north to reach Bush Street then take a right. For walking directions from Powell Station you will need to walk north on Powell Street (along the cable car tracks) after exiting the station, towards Union Square. After passing Union Square, walk two more blocks to reach Sutter Street where you will take a left turn. Walk for a ways along Sutter Street until you start going downhill a bit and reach Larkin Street. Take a right on Larkin St., one more block north to Bush, then a left turn and we are there in the middle of the block. For bus transit to the Hotel from Powell or Montgomery Stations, it is recommended to take the 38 bus on Geary Blvd. (along Union Square), or the 2 or 3 bus on Sutter Street. These will both take you to within a few blocks south of the hotel if you get off at Larkin or Polk Streets.